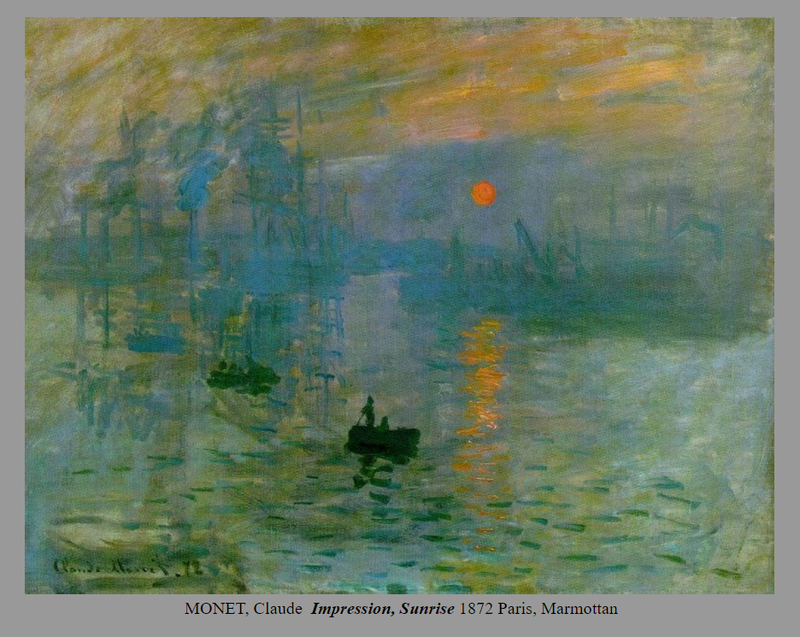 The first two decades of the 20th century were heavily influenced by the movements of Impressionism and Post Impressionism. In Impressionism one of the main qualities of the paintings were that they focused on visual experience, such as the color of light, brushwork, texture, while the content of the paintings was less important. One way of looking at Impressionist painting is that whatever the Impressionists were painting such as a person or landscape, was only an excuse or reason to explore the more abstract qualities of color, paint, and light. 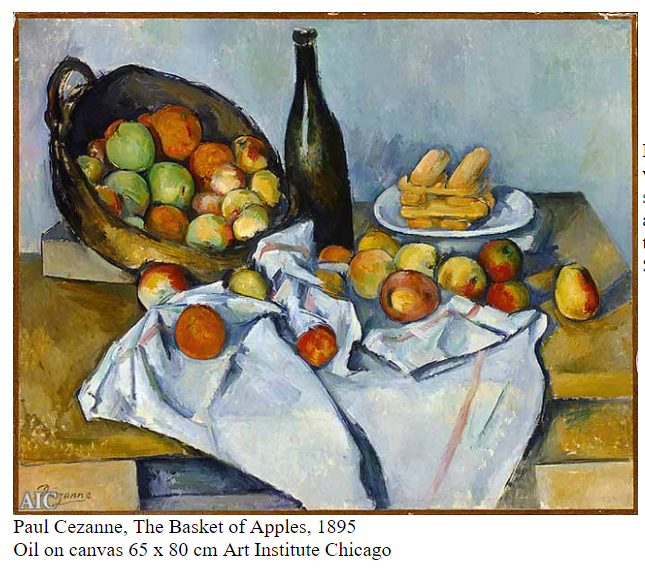 The Impressionists gave way to the so-called Post Impressionist movement at the end of the 19th century most notably artists such as Cézanne, Vincent van Gogh, and Paul Cézanne. These artists combined an interest in content or subject matter along with the more formal physical concerns of paint color and texture. 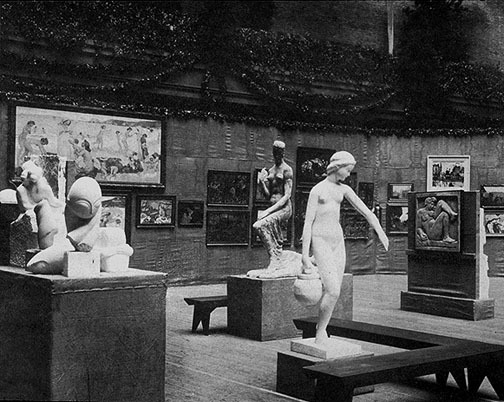 Both of the movements dealt with elements that art historians refer to as “form” which is really the physical qualities of the paintings. However, the physical properties or formal qualities of painting quickly became almost as important a subject to explore in paintings as what they portrayed. These qualities could Paris referred to as the more abstract qualities. The artists in the first two decades of the 20th century, have a kind of permission or precedent set by the previous movements to literally try new things in painting and explore new subject matters such as abstraction, politics, science, war, and spirituality. 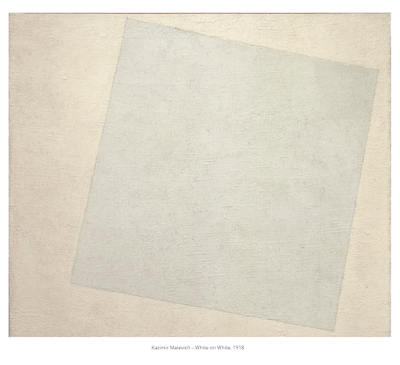 Kasimir Malevich was a Russian artist who became famous for exploring more formal elements in his work. Malevich explored primarily design concepts and non-objective or nonrepresentational ideas in his work which he felt were purely about the beauty of nonrepresentational or abstract forms. In his painting, “The Aviator,” from 1914 Malevich begins to explore something that was also being explored in France and Spain during the first decade of the 20th century by Picasso and other Cubists. 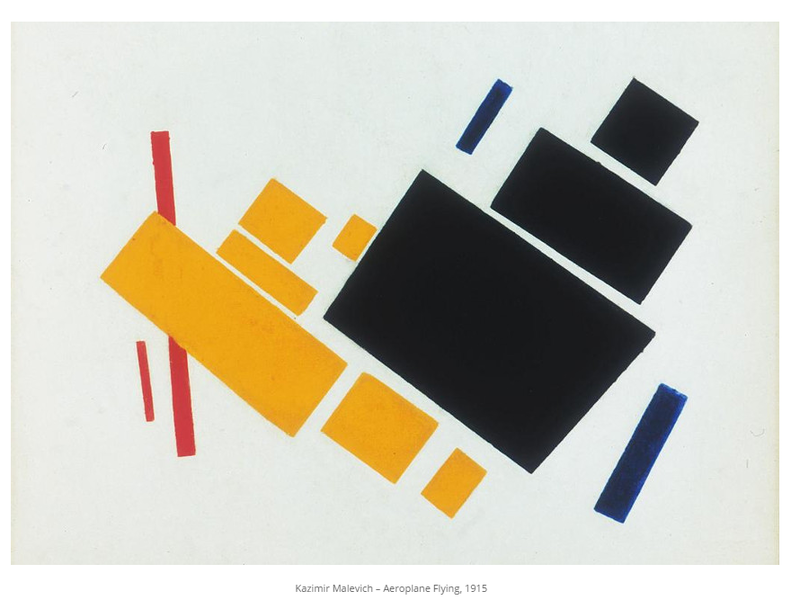 Malevich combines a Cubist way of reducing or abstracting things such as people, fish, playing cards, and text to give a sort of picture or portrait of an aviator. His vocabulary in this painting of cubes, and fractured geometric forms to describe things in the real world is not very original or unique compared to what other artists were doing in this decade. In 1915, Malevich makes a painting that he titled, “Suprematism.” The title implies that forms such as rectangles and colored squares were the supreme expression of some sort of aesthetic system or artistic vision. 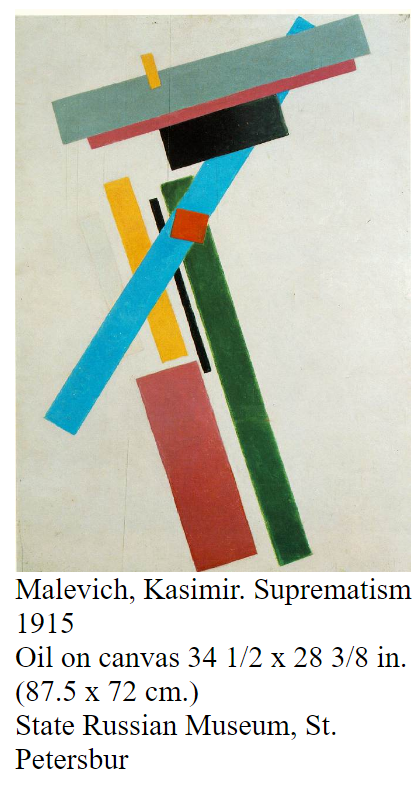 Suprematism as the style disregards any of the conventions having to do with, the creation of space in terms of traditional perspective, shading, or color. Instead it focuses mainly on the beauty of pure form. Here’s a quote from Malevich about his goals. "I have torn through the blue lampshade of color limitations, and come out into the white; after me, comrade aviators sail into the chasm-I have set up semaphores of Suprematism. Sail forth! The white, free chasm, infinity is before us." 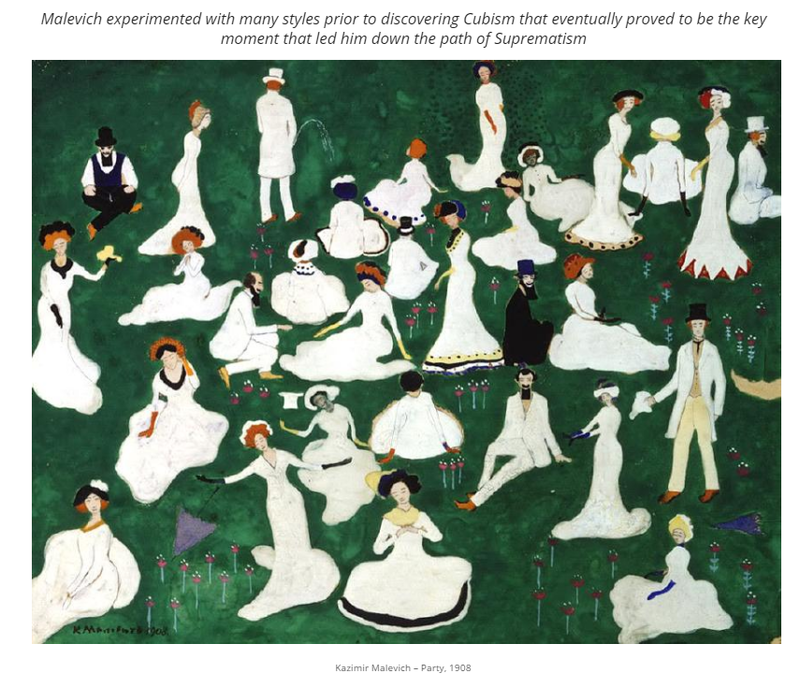 Probably, as important as looking at Malevich’s paintings is understanding the world an environment that allowed him or gave him permission to make paintings like this. Obviously the abstract qualities of the late 19th century painting allowed painters to explore nonrepresentational painting. 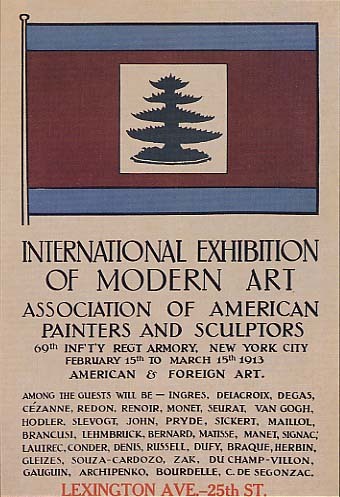 Also, in the first two decades of the 20th century particularly in Paris and in New York there were a series of groundbreaking shows that promoted nontraditional forms of art. 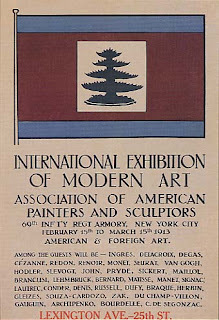 In 1913, there was a famous show given in a converted ammunitions warehouse called, “The Armory Show.” This show introduced New Yorkers to many of the avant-garde and experimental artists of the early 20th century as well as the 19th century and pave the way for artists such as Kasimir Malevich to have similar exhibits in Russia. Artists such as Malevich and Cubists were instrumental in creating an environment in which paintings that were considered nonrepresentational or abstract important and also gave permission to later artists to experiment more with the physical properties of paint, color, and texture without regard to making some sort of illusion or representational painting.